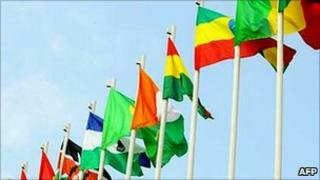 A United Nations report accuses Eritrea of planning a car bomb attack at an African Union summit in Ethiopia. The UN Monitoring Group report on Somalia and Eritrea says the aim was to disrupt the summit in Addis Ababa last January. Ethiopia accused its neighbour of training rebels to carry out bombings on targets in the city, including an international hotel. Eritrea has repeatedly denied any involvement in such a plot. "We say this is totally a fabrication and the report is absurd. We have never been involved in any acts of terrorism," said the Eritrean ambassador to the UN, Araya Desta, in a radio interview with the BBC's Focus on Africa programme. The report states that Asmara's spies are active in Uganda, South Sudan, Kenya and Somalia, posing a threat to regional peace and security. The UN interprets the plot as representing a shift in tactics by the Eritrean intelligence services. "Whereas Eritrean support to foreign armed opposition groups has in the past been limited to conventional military operations, the plot to disrupt the African Union summit in Addis Ababa in January 2011, which envisaged mass casualty attacks against civilian targets and the strategic use of explosives to create a climate of fear, represents a qualitative shift in Eritrean tactics," said the report. It outlines the details of the plan: to attack the AU headquarters with a car bomb as African leaders took breaks, to blow up Africa's largest market to "kill many people", and attack the area between the prime minister's office and the Sheraton Hotel, where most heads of state stay during AU summits.